A happy budgie will sing often. 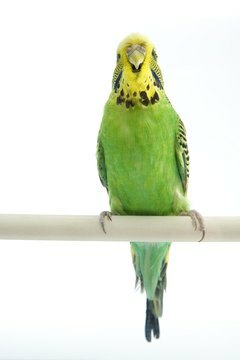 Budgies, or parakeets, love to communicate with sound. If you've had your budgie for any length of time you already know that the variety they produce is almost endless. But what do all those sounds mean? The best way to find out is by spending time observing your bird. With the ability to make such a huge variety of noises, some very similar, a lot of your budgie's vocalizations are best interpreted by considering his body language along with the sound. For example, if his wings are partially spread or flapping, he is probably stressed, but if he's sitting comfortably with his feathers slightly puffed up he's relaxed and happy. At first it might sound as if he's making the same type of noise during these two different moods, but if you listen carefully and pay attention to his body language you will soon hear the difference. Parakeets love to sing when they are happy and content. Singing is often done in groups and it lets members of the flock know that they are safe at the moment. A budgie's song can consist of chirps, trills, whistles and any other sounds your bird has learned. A constant stream of sounds from your budgie when he is acting relaxed simply means that he is feeling good and enjoying himself. Chirps can have many different meanings. Sometimes they are like shortened songs, and are your budgie's way of letting you and his flock know that everything is all right. They can also be used to let everyone know where he is. Some parakeets will learn to communicate their needs to you by chirping to request food, water or attention. Loud, high-pitched chirps can also reveal that your bird is either excited, upset or scared, depending on his body language. A series of chirps might turn into full-fledged screaming if he becomes too stressed. A chattering parakeet may seem to be mumbling to himself. This is a sign of contentment and feeling safe. He might also use chattering to get another bird's attention or as part of courtship. Some budgies will spend a lot of time chattering at their own reflection, almost as if they are trying to attract the great mate they see in the mirror. Screaming can take on many forms, like a short yelp, a long distressed cry or a shriek. It's not easy to mistake a scream though, since it's a loud call for help. A scream means something is wrong and your budgie might have been startled, hurt or frightened. If your budgie is not hurt physically or in any real danger, put a cover over his cage to help calm him down and make him feel safe. Budgies don't hiss quite like snakes or cats, but make a sound that is probably best written as "Tsssssssk!" Your budgie will make this sound when he is feeling defensive or angry, or is trying to warn you or another bird to get out of his space. Since budgies love to communicate by making noise and are good at imitating sounds they hear frequently, your bird will probably make a lot of sounds that are not on this list. He may be copying the sound of the phone ringing or a song he hears a lot, or he may just be enjoying himself by discovering new sounds that he's capable of making. A happy parakeet isn't usually loud like many other pet birds, but will spend a lot of time making fun, happy sounds. There may not be a human interpretation for each sound, but his body language will let you know whether it is meant to be a happy sound or a distressed one. Budgie Place: Listen to Recorded Budgie and Parakeet Sounds! What Does Squawking Mean With Parakeets? How Can I Tell if My Parakeet Is Happy?